i watched an episode of matlock today. i used to watch matlock all the time as a kid, but i actually saw an episode today that i've never seen before. it was pretty wild--it involved a cult, brainwashing, a son saying his father killed his guru, ect, ect. it was cool. since moving to a desert, we've become big fans of succulents. 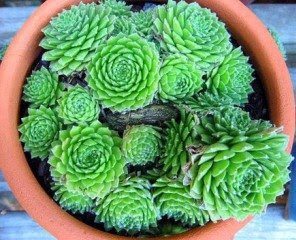 one of our favorites is the beautiful hens and chicks (shown above). a few weeks ago we tried planting a few "blossoms" in our park strip, which if you've seen it is in need of some help. they didn't seem to be thriving, but they were doing ok. then one evening i happened to be going out to get the mail and saw a little neighborhood girl picking them out of the ground. and that was the downfall of our hens and chicks. at some point i'd like to get some more and maybe grow them in a pot like the picture. in the meantime i bought a small pot of succulents from the local farmer's market. they stay in the house and are doing well. and b gave me a potted succulent plant for my birthday that we planted in the yard awhile ago. we planted it far away from the park strip--so it should survive as well (fingers crossed). 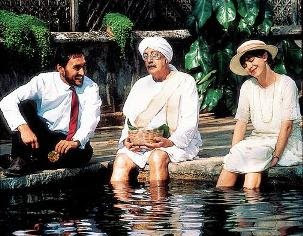 brian and i watched the 1984 movie a passage to india (based on the novel of the same name by e.m. forster). it was a really interesting and engaging movie. i haven't read the book, but i can vouch for the movie. if you haven't seen it, i'd strongly recommend it. brian and i went on a walk last night through our neighborhood, and we made it to some new areas. we discovered a byu horticulture place/garden (it was official with a sign and a gate and everything). interestingly, though, there was nothing really there other than a field of grass and some bleachers (to watch something?). we did see some nice quail though, and maybe that's why byu holds onto it. quail need a place to roam too. we also found this crazy tree that has really big and unusual-shaped leaves with long seed-pod things hanging off of it and the most beautiful flowers. they looked liked orchids. i brought some that had blown off home to enjoy. we also came across a nice cherry tree with ripe cherries. so we ate those on the way out and on the way back. and it started raining on us when we started heading back. it rained pretty good, but it was a plesant summer rain: not too cold or heavy. we walked as leisurely on the way back in the rain as we had before it started raining. and then to top off a nice walk through the neighborhood, a huge rainbow came out. it was perfectly formed with both ends appearing in vivid color. 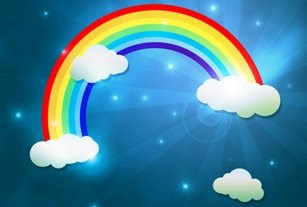 it seems like such a long time since i've seen a rainbow.